The Top 6 Most Profitable PTO Fundraisers: How Much Can You Earn? When schools plan trips, need equipment, make renovations, or want to make any other kind of improvement, sometimes school district administrators fall short on funding, because these are unplanned expenses. Now it’s up to you to find a PTO fundraiser. You need high profit margins, low upfront costs, and great ideas. These are our top 6 most profitable PTO fundraisers. Actual earning potential may vary based on school size and participation. Some schools have found big success with selling tickets for a dance class in their gymnasium. The whole community can come out to support your cause. People of all ages have fun with a beginner’s Zumba or salsa dance class, and one of your parents may already be an instructor. That exposure is great for new business, so there's no expense in hiring a teacher. Combine this with a refreshment stand and earn an extra $100. If a member of your PTO board teaches any kind of classes, you can put their talents to work. An arts and crafts class works well - especially if there’s wine involved! Set up a school-wide Halloween night with a haunted house in the gym. Teachers can get involved by handing out candy from their classrooms while students walk around the school. A haunted house is a very low-cost PTO fundraiser because the whole effort stays in school. Remember to be sensitive with scary costumes around younger kids. A funny run is just like a traditional 5K, but you get to choose a theme to dress up for. Zombies and movie characters are a couple of themed ideas. Pick a theme that your kids will have fun with, and put an ad in your local newspaper. A funny run takes more planning than other PTO fundraising ideas, but it can pay off. Have students design a t-shirt, whether on paper or using a computer. Have students vote for the best design, and get it printed...talk to your screen printer about the right mix of shirt sizes. This is great for a middle school PTO fundraiser, because it gives graphic design students a project to work on, and lots of students wearing the shirts builds school spirit and teamwork. Since 1949, we’ve helped schools and other organizations raise more than $4 billion! Individual students have raised upwards of $5,000 with us...we're proud of those accomplishments! Get in touch with your local representative to create a winning PTO fundraising strategy. 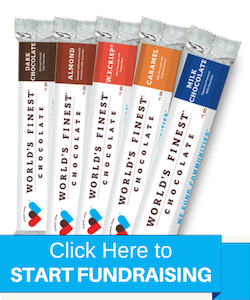 Or, learn more about World’s Finest Chocolate in our free fundraising guide. Get started today! Check out some of our success stories!